Carly Simon is one of the greatest female rock’n’rollers of her generation. She achieved megastardom before the age of 30 with such hits as “That’s the Way I’ve Always Heard It Should Be,” “You’re So Vain,” “Anticipation,” and “The Right Thing to Do.” Possessed with a tremendous voice, a magnetic personality, and good looks, Simon married fellow singer-songwriter James Taylor in 1972. Their relationship proved to be a stormy affair, ending in divorce eleven years later. Simon has amassed her fair share of honors in the course of a storied career. She won two Grammys (including Best New Artist in 1972), got inducted into the Songwriters Hall of Fame in 1994, and ranked #28 on VH1’s “100 Greatest Women in Rock and Roll” that aired in 1999. Perhaps the most notable achievement came after the 70s (a decade the star dominated with seemingly single after single making it to the Billboards chart) when the song “Let the River Run,” written specifically for the 1988 film Working Girl, won a Grammy, Academy Award, and Golden Globe Award. It marked the first time in history an individual received such recognition “for a song both written and performed entirely by a single artist.” Other highlights for Simon included becoming a successful author of children’s books and joining the ranks of singers who put out smash hits for James Bond films. In her case, “Nobody Does It Better” provided the theme for The Spy Who Loved Me; overnight the tune established itself as an international sensation and ruled the radio airwaves in the summer of 1977. Simon makes her home somewhere in Martha’s Vineyard. During his presidency Bill Clinton vacationed in the summer at this spot in Massachusetts. He is a huge fan of Simon’s who has her song “I Get Along Without You Very Well” on a playlist of his 20 Favorite Songs of All Time. 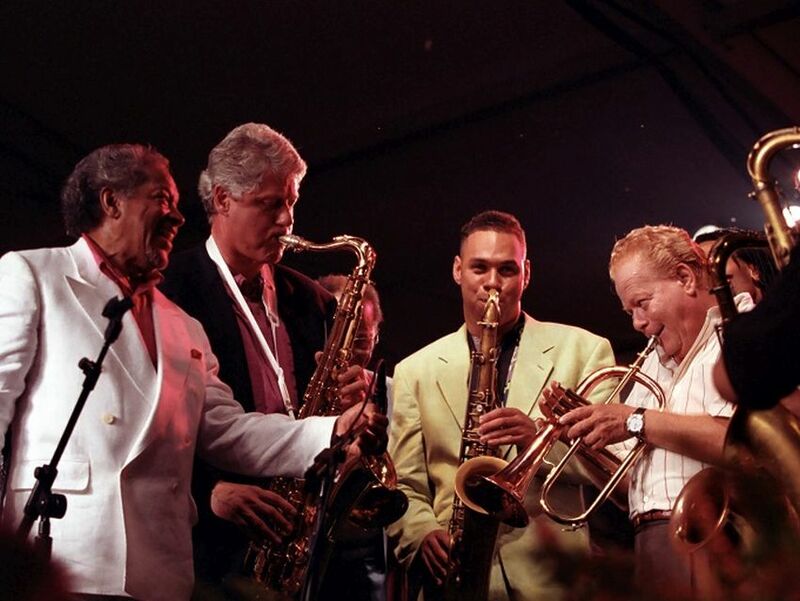 At Martha’s Vineyard, Simon performed for Clinton’s 50th birthday in 1996 and for his 65th birthday in 2011. 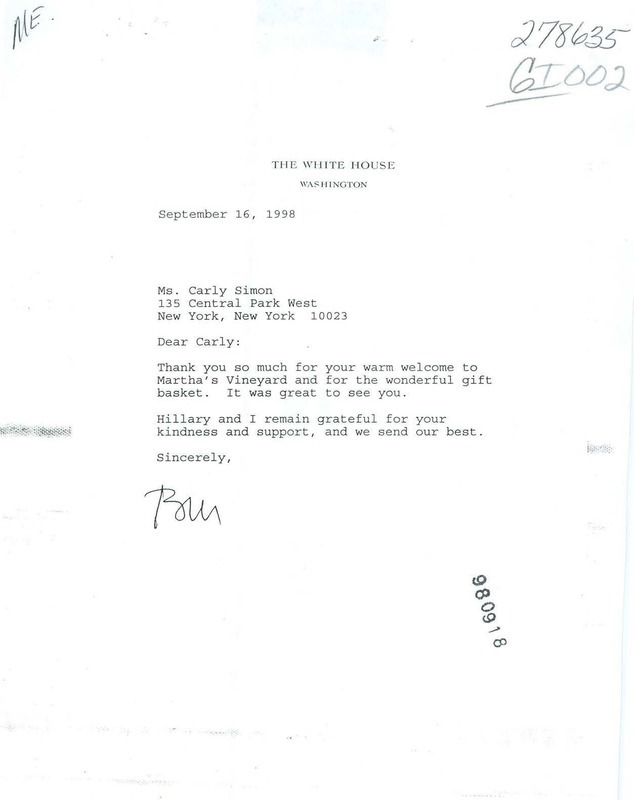 The document on display is a belated thank you note from Clinton addressed to Simon. Written approximately one month after he spent part of the summer at Martha’s Vineyard, the short missive warmly recognizes Simon for her enthusiastic greeting and gift basket. The photo on display shows Simon and Clinton at Martha’s Vineyard on August 18, 1998. The document and photo are from the Archival and Audiovisual Department of the Clinton Library and Museum.